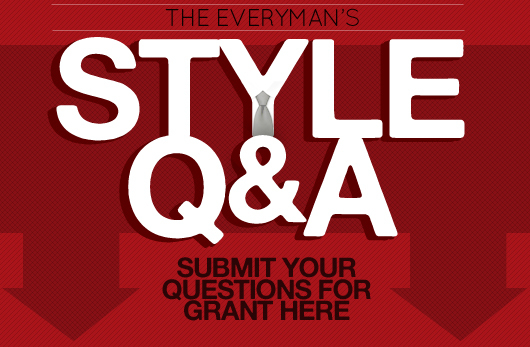 Professional style consultant Grant Harris responds to your questions about how close your socks and pants have to match, if buttoning your polo to the top is nerdy, and finding quality brown lace up shoes for a man on a budget. 1. I know the general practice is to wear socks that match your pants. What if you don't have, and can't find, socks that match the color of your pants? I have a light gray pair of dress pants, and I'm regretting the purchase because I can't find socks that blend well beneath the color of the pants. Sounds like you’re looking for an exact copy, and not a match. On the other hand you may just be color blind. That I can’t help you with. The idea is to create a symmetrical look. Gray pants and red socks won’t do it—although I highly recommend bucking the general practice and showing some color at the ankle. Gray pants and a similar shade or tone of gray will get the job done. The idea is to get as close as you can without breaking up the line of the leg. You should never regret a purchase unless the garment is of poor quality, poor construction, or didn’t fit when you bought it. While socks are my personal indulgence I realize my pants are more important. You should too. 2. When I wear a nice polo-style golf shirt (under a blazer or on the course), I like to button the top button. My wife says I look like a nerd when I do that. Is she right? Buttons can be quirky. Some men like to leave one or two undone. Others like you like to be buttoned up tight. There is no rule that says you shouldn’t button to the top. It’s good that you care what your wife thinks, but unless she’s joining you on the course or you’re wearing a polo shirt when you should be wearing a dress shirt then go with what makes you comfortable. After all she won’t leave you for looking like a nerd. 3. I'm looking for a good pair of brown lace ups; they'll be my first and will compliment my black oxfords and my collection of sneakers. It's not for work since I’m still in college but I've been trying to dress better overall. They should be dressy enough to wear with a suit but still be able to wear occasionally with jeans. What should I look for in my first pair of brown shoes? Do you have any recommendations for under $175? 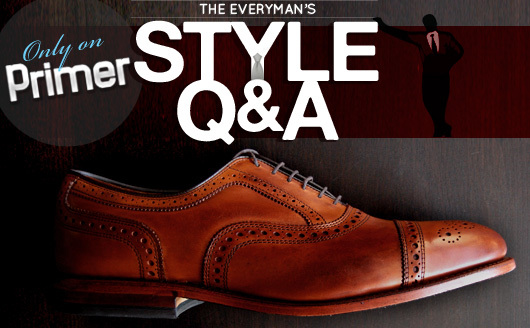 What you’re really asking is, what are the cheapest shoes you can get that still look good. As the saying goes, “if you want to see a well-dressed man, look down”. If you skimp on your shoes everyone will know. While you may not be looking for a job or a wife today you most certainly will be in the future. With this in mind you should buy the best quality you can now to last you through the years. Unfortunately, your budget is limited. In my years in this business I’ve come across several brands that offer good quality shoes at a more sensitive price point. Try Cole Haan, Florsheim, Rockport, Bass, and/or Geox. You may have to shop online or at discount stores to find them but it will be worth the search. Try these options. Depending on how often you wear your shoes and the condition you keep them over the next five years cheap shoes made with inferior materials like glue, plastic, and polyurethane may wear out and you’ll have to replace them 3 times on average—do the math on that. On the other hand if you invest in a more expensive pair of shoes from a quality shoemaker you most likely won’t have to replace the whole shoe. Instead you may have to only replace the heel or the sole every 10 years which can be done for $20 at a cobbler. Quality shoes are going to cost money. So, while in the meantime you may have to do with a lesser quality pair be sure to save up and put your hard earned money into shoes that will get better with time, not worse. You’ll be a better man for it. Trust me. Disagree on the polo buttons. The rule is: always leave at least the top button undone, and the bottom one buttoned. Buttoning them all does make you look nerdy. On the flip side, leaving them all undone usually just looks sloppy. I would argue further, that you should always leave the top button of a button-down undone, unless wearing a tie. Undershirts are also a must. What if the polo only has two buttons on the placket? Would your rule still apply? They have a variety of colors. I picked up the wine (like a reddish brown) and it’s gotta be one of the best shoe purchases I’ve made. They’re so damn comfortable, and the build is really great. Seems to be within the guy’s price range as well. @JOHNNY – rules are meant to be broken 🙂 Skinny hipster dudes seem to pull off the ‘all buttons buttoned’ look pretty well. Heftier gents probably wouldn’t. I think it’s all a matter of choice and knowing what looks good and what works best for your own personal style. ps, I never wear undershirts. I have always held these words close to me and they have never led me astray! Every review of them that I’ve read has been positive. Great tip Adam, they look great in brown. Steve, good adage, I agree! Truly, the best way to get things done on a budget is thrift, garage sales, and secondhand shops. It may take a little longer, but it is more than worth the wait. I’ve found in the past couple of weeks alone: Denver Cap-toe from Ralph Lauren for 40 at Salvation Army (found them on their site for 1250), black wingtips from Florsheim and Bostonian for 8 each at a garage sale, and a pair of chukkas from Johnston and Murphy for 5 at Goodwill. It takes time and travel, but the outcome far outweighs what I’ve put in…plus, I look pretty dapper with shoes that a rich man can hardly afford.